I love Alexander McQueen, not just because of Sarah Burton's incredible take on the brand, really carrying on such an extraordinary legacy and executing it to a T, but the history behind the brand and how unapologetically British it is. For me, when Alexander McQueen designed for his founded fashion house, I always thought that he saw Fashion as an art form, his pieces were absolutely mesmerising, captivating and transfixing. His talent, creativeness and attitude towards fashion had changed the industry forever, and his incredible legacy will live on forever. 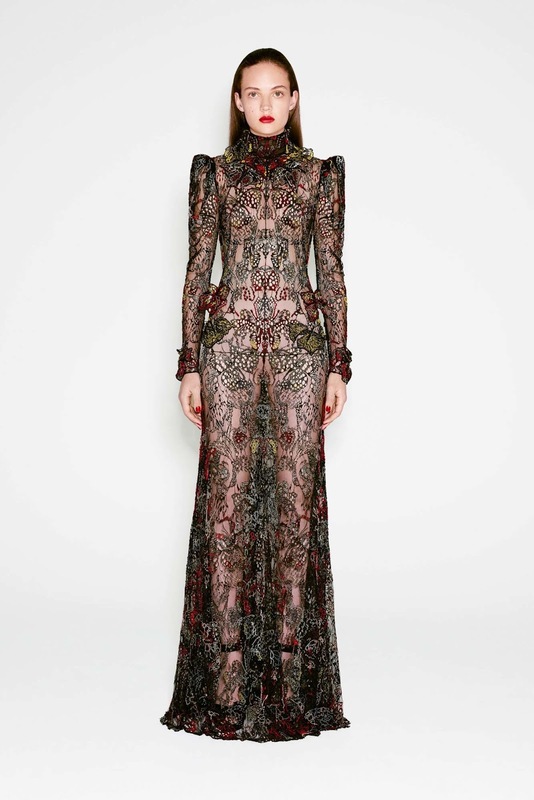 This collection was exactly what I wanted and expected from a McQueen collection. The vintage and the dark romantic influence the collections usually convey were presented so well by Sarah Burton with these looks. The detail that was incorporated onto the garments is absolutely mind-blowing and the behind the scenes work and design is so clever and unique. The finished collection reflects the effort and talent inputted into the collection anyway. The first look was what I would describe as Typical McQueen. The gorgeous python dress with floral prints in red and deep purple colours - finished with beautiful burgundy fur attached to the neck of the coat. When I saw this first look, I instantly knew this collection was going to be mind-blowing. Sometimes I find McQueen hard to wear. For me, you have to be very brave to wear a McQueen design. See Rooney Mara wearing that Alexander McQueen number at the 2016 Golden Globes. It divided opinions, but one thing we can all agree on is that she was daring and brave to wear the dress. It was inspired by McQueen's 2003 "Shipwreck" collection, Sarah Burton had took inspiration from his previous collections for the new ones she designs for the Fashion House. So personally, I loved that dress on Rooney but many said it was very hard to pull off. I didn't just love the dress because of the story behind the design, but I feel she is the only woman who could pull that off both elegantly and strongly. Rooney Mara wearing Alexander McQueen at the 2016 Golden Globe Awards. As previously mentioned, the embellishment and embroidery is the main contribution in what made this collection so great. The prints and designs, as well as the style of the garments, really made the collection appear vintage and luxurious. She included a black coat which was plastered with different images such as lipsticks, butterflies, lips and of course, the iconic Alexander McQueen skull image. I loved that she keeps some of the tradition and so loved aspects still in the collection. This coat was of course, very bold and flamboyant so she teamed the coat with some plain black shoes to balance the look, making it of course wearable. If she had perhaps teamed the coat with a dress that was also heavily embroidered then perhaps it would have been more difficult to pull off. Sarah also included a lot of fur this Pre-Fall season in the colours Burgundy, pink and tan. The fur just added to the luxurious and expensive feel of the collection and collaborated well with the tanned embroidered coat, and just adding a pop of colour with a simple black double-breasted coat. I loved it, I think Sarah Burton has nailed this Pre-Fall collection and I cannot wait to see what she brings to the AW16 runway next Fashion Month.